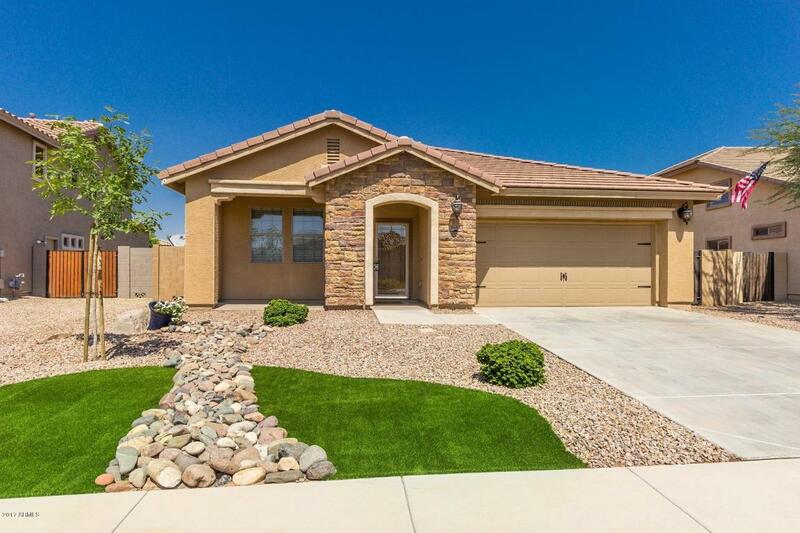 Exceptional open flow floor plan in this 3 bedroom, 2 full bath home of 1990 sq ft. Wood laminate flooring throughout the house with an open den in front with window. Formal living room and family room add to the spaciousness of this home. Large kitchen with all appliances included plus nice size kitchen island for extra counter space & used as a breakfast bar. Huge family room. All bedrooms have wood laminate flooring, ceiling fans & crown molding for that extra touch. Master bedroom has a separate outside exit to one of two covered patios. Master bath includes separate shower/tub and double sinks. Built in media desk outside master bedroom. Backyard is synthetic grass & included is a 8X16 ft tuff shed. This distinctive home deserves consideration! Look for the *3D-Tour*!